Do you have high utility bills? How about rooms that are too cold in the winter and too hot in the summer? These are just a few of the problems that you might experience if your attic insulation isn't up to par. Fixing air leaks and adding insulation to your attic is one of the easiest, most cost-effective ways to make your home more comfortable and reduce heating and cooling costs. Complete Home Solutions specializes in insulating attics of all shapes and sizes. Looking for a quote for attic insulation? Call us at 1-855-247-9984 or click below to request a consultation and free estimate at no obligation in Annapolis, Glen Burnie, Pasadena or the surrounding areas. "Just the time and attention that the sales person paid to the house and..."
Just the time and attention that the sales person paid to the house and then explained where we would get the best bang for the buck. We were quoted prices slightly above and well below but the level of expertise CHS brought to the table let me know we would be getting our money's worth for what we were spending. Also the references and customer satisfaction ratings were better than the other groups we looked at. "He was so knowledgeable and helpful. I completely understood his analysis..."
He was so knowledgeable and helpful. I completely understood his analysis of our house. Pepco stated we were 70% more energy use than other houses our size. We needed Complete Home Solutions. "This team was better than a 5. They were amazing. They walked me through..."
This team was better than a 5. They were amazing. They walked me through the process. Helped me to understand where potential issues might be in my vent system and even helped identify a couple of places where there might still be issues after the vent treatment because the holes are larger than the chemical can seal. On time and explained the all installation throughout. How can I improve my attic insulation? Should I replace my attic insulation? These are just a few of the questions we get all the time from homeowners just like you. 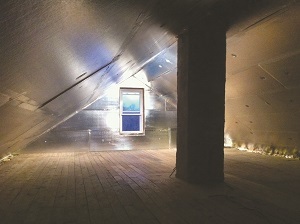 SuperAttic insulation and attic conversion system. When you choose Complete Home Solutions as your attic insulation contractor, we take all the guess work out of choosing the best insulation solution. Attic insulation is our specialty. Contact us to request a free estimate today.